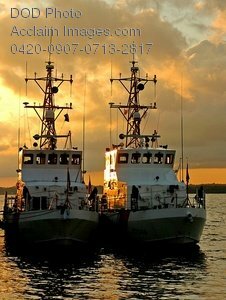 Description: Free, public domain image: U.S. Coastguard Cutter Ships . The U.S. Coast Guard cutters Flyingfish, of Boston, and Hammerhead, of Woods Hole, Mass., temporarily moor at Naval Station Newport, R.I., Nov. 6, 2007, for a cutter roundup. The cutters are two of 15 present and 27 represented from throughout the 1st Coast Guard District, which covers from Maine to New Jersey, participating in a three-day training event. (U.S. Coast Guard photo by Petty Officer 2nd Class Lauren Downs).